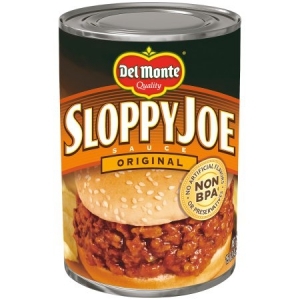 We were pleasantly surprised that Del Monte sloppy joe sauce tasted really good with mixed with lot-fat beef and onions. Trust me, I was one of the biggest Manwich fans on the planet and I still probably prefer Manwich just a tiny bit more than Del Monte sloppy joe sauce, but when you consider the price, Del Monte comes out on top. I compared the ingredients, they were very similar. As you can guess, the sauce is mostly sugar. a lighter brown and results in barbeque that is lighter in color. I also find Del Monte sloppy joe sauce to be a little less spicy. My young daughter does not like spicy food and she seems to like the Del Monte better.